We are revising our 2018 growth forecast to 4.3% from 4.0%. While recent growth performance undermines our end-year USD/THB forecast of depreciation to 35.0, we will wait for more concrete developments on the US-China trade tensions before making any revisions. Thailand’s economy performed better than expected in the second quarter, drawing support from continued strong exports and manufacturing. GDP grew by 4.6% year-on-year in 2Q18, faster than our 4.5% forecast and the consensus 4.4% view. 1Q18 growth was revised up to 4.9% from 4.8% initially. Today’s report prompts an upward revision to our 2018 growth forecast to 4.3% from 4%. 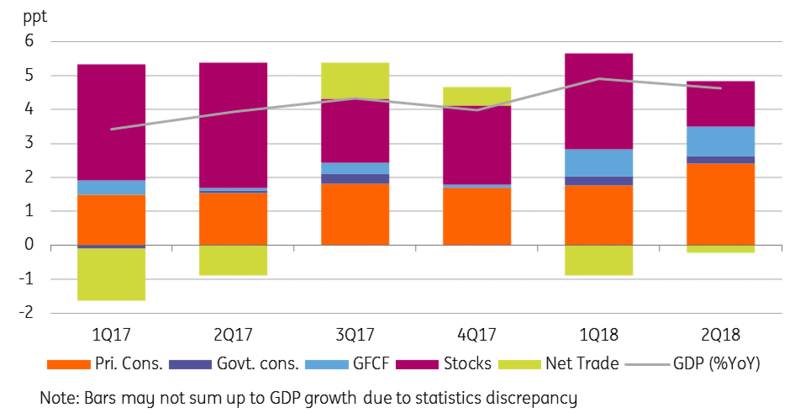 The expenditure breakdown revealed net exports remaining a drag on GDP growth for the second straight quarter, albeit by less than the first quarter (see chart). This is consistent with a year-on-year narrowing of the current account surplus. In terms of the current account, exports continued to strengthen, but imports derived their strength mostly from oil, where higher global oil prices boosted the import bill. On the domestic side, there was a marked improvement in the private consumption contribution to GDP growth, to 2.4 percentage points (ppt) in 2Q from 1.7ppt in 1Q. However, there was no improvement in government consumption or gross capital formation. An upswing in the inventory cycle continued to play a key role in driving the headline GDP number - possibly a bad omen for future growth. Services remained the key industry-side driver of GDP growth. July trade data due on Tuesday (21 August) will provide a glimpse of where the economy is heading in the current quarter. As elsewhere in Asia, we believe Thailand’s exports strength likely persisted in July. But the trade war makes things uncertain for the remainder of the year, imparting downside risk to the official growth forecast for this year - the Finance Ministry recently raised its 2018 forecast to 4.5% from 4.2%, while the central bank’s (BoT) forecast is 4.4%. Just as the trade war risk looms, and with the likelihood of inflation falling short of the BoT’s 1-4% policy target in coming months, an on-hold central bank policy looks to be a safe bet for the rest of the year. After a significant Thai baht (THB) sell-off in the 2Q with a 6% depreciation against the US dollar, the currency has returned to its position as one of Asia's outperformers since July. Although this weakens our confidence in our forecast of the pair trading toward 35.0 by end of the year, we aren’t changing this forecast until more concrete news on the US-China trade tensions emerges.